A unique concept in bridle design. The Micklem Multibridle design is based on the shape of the horse's skull. 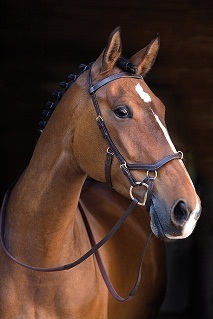 The Micklem Multibridle design is based on the location of sensitive nerve pathways in the horse's face and head. The Micklem Multibridle design is based on the location and position of the horse's teeth. Traditional bridles are basically designed on the outward appearance of the head. Not the Mickem. The straps are positioned to hold the bridle in a comfortable position, avoiding fragile bones, facial nerves, protruding upper jaw and molars. Additionally, the design reduces shifting and keeps the bridle in place. Comfort features include a padded crown piece and wider straps that stay put and reduce pressure points. The Multibridle combines four pieces of equipment into one. It can be used as a longe cavesson, bitted bridle or 2 types of bitless bridle. This is a leather bridle. Directions for use are included with the bridle.